In 2002 I returned to India, visiting Calcutta, Darjeeling and Kalimpong, and staying at heritage hotels in all three. The primary objective of the trip was Bhutan. I took a taxi through the tea plantations of Sikkim to Phuntsholing, it's only entrance by road, and climbed 6000 feet in a Toyota Land Cruiser to the Dragon Kingdom of Bhutan. Isolated for centuries, and open only to package tours in recent years, 2000 tourists a year are admitted to this Switzerland-sized mountain country. The road up from the Indian plain was built by Nehru in the 1960's, and before that the only way into Bhutan was by walking. In the 1990's an air strip was built in the Paro Valley, and I decided to drive up Nehru's road and fly out to Bangkok on Dragonair. The primary attractions are majestic Dzongs, fortresses that look like Swiss chalets and Tibetan monasteries, built in mountain valleys 400 years ago to keep out the Tibetans. The crowning glory is a tiny one perched on a cliff face 3000 feet above Paro Valley called Tiger's Nest, founded by a Tibetan monk who arrived on a flying tiger in the 8th Century. It's a five-hour hike up the mountain to the monastery, and two hours back down. 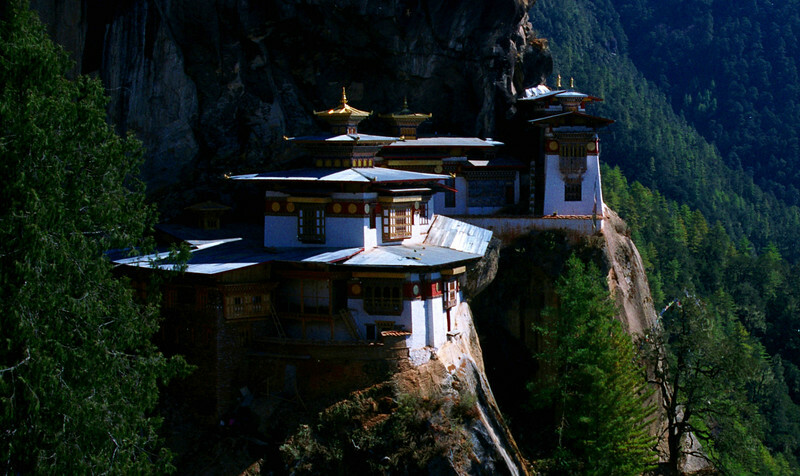 Bhutan's Tiger's Nest, or Taktshang Monastery.